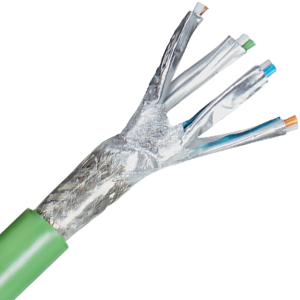 CAT.6A cables have supported fast data transmission rates in industrial Ethernet systems. Yet these cables did not offer the continuous flex or torsion design features needed for moving machine applications. Our new ETHERLINE® CAT.6A cables remove this limitation. In an industry first, the new ETHERLINE® cables combine CAT.6A’s 10 Gbit/sec data transfer rates with continuous flex and torsion performance suitable for robotics, machine vision systems, wind turbines and other industrial machines with motion systems. Previous continuous flex industrial Ethernet cables offered data transfer rates of max 1 Gbit/sec. To get your FREE sample, fill out the form provided.